SCHOOL OF PHARMACY RESEARCHER WINS INVENT 2017! Phion Therapeutics, a Queen’s ‘spinout’ company founded by Professor Helen McCarthy from the School of Pharmacy, was announced as the overall winner of Invent 2017 at a gala event in Belfast’s Waterfront Conference Centre last night (05 October 2017). Over 600 guests attended the highly anticipated Invent Awards from Connect at Catalyst Inc., sponsored by Bank of Ireland UK, for the annual showcase of the best and brightest innovators that Northern Ireland has to offer. Professor McCarthy was awarded a prize package of £13,000 and one of the sought after spaces on the NI Tech Mission to California in January 2018, for technology that is set to transform the way drugs are delivered to cancer patients, with the potential for much improved outcomes. Phion Therapeutics, which also won the Life and Health prize, has been developed by Professor McCarthy over 11 years of extensive research involving protein fragments called peptides that could have a significant impact on the pharmaceutical industry and revolutionise how drugs are delivered to parts of the human body. “Phion has been able to concentrate various anionic drugs into tumours while preventing delivery to normal or healthy tissue and cells,” said Professor McCarthy. “This is potentially revolutionary for the treatment of cancer. The list of potential applications is almost limitless. 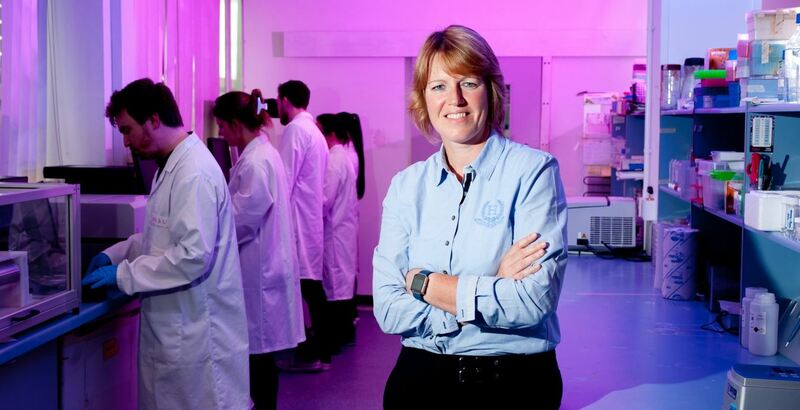 Together with Boston based entrepreneur David Tabaczynski and the Queen’s business incubation centre QUBIS, Professor McCarthy set out to prepare her technology into the commercial application earlier this year. Commenting on the latest award winners, Gavin Kennedy, Bank of Ireland UK’s Head of Business Banking NI, said: “Many of us dream about making a difference, of having an everlasting positive impact on people whilst making some money along the way. “Invent 2017 winner’s innovation has the potential to do just that! “Once again, the participants and winners showcased the high calibre talent and commercial potential of Northern Ireland’s ever growing, vibrant entrepreneurial community. “Bank of Ireland UK is delighted and proud to continue to support them in their ambition to be the SMEs of the future.” Invent offers an opportunity for the innovators of Northern Ireland to come forward and be recognised as the next ‘big thing’ and this year attracted a record breaking 144 entries across six categories. “The Invent Awards is the leading night of innovation in Northern Ireland,” said Connect director Steve Orr. HurtLockers – an electronic first aid kit – won the Overall Student Invent Award for Daniel Laverty and James Carson. Each category winner received £2,500 and a place on the NI US Tech Mission.